Ninety minutes after scarfing down a pie at 800 Degrees, I did another loop around SLS - looking, seeking and stomach grumbling. I've already eaten at Northside Cafe and 800 Degrees today, everything else is closed except Umami Burger. A little over a year ago, we published a "Vegas Eats Preview" of Ubuntu Burger and the rest of the L.A. based restaurants coming to SLS. Our preview dining series was so successful, a local weekly newspaper in Las Vegas hired a pre-eminent, sorta-famous L.A. food critic to retrace our footsteps through sbe dining. Our paths diverged when said critic filed gushing non-reviews of these joints. The truth will set you free! So I'm here. Returning for the first time to Uhura Burger at SLS Las Vegas. I'll guess that this is probably my 8th time eating at Umathurman Burger, starting with the original (now closed) location way back when. The first burger was a revelation - juicy, rare and uniquely flavorful. The second was pretty damn good too. As Ustream Burger has expanded, what made it unique - spectacular, meticulous, gourmet execution - has been downsized. Peering into the space from outside, I see more TV sets than Dominick's Widescreen Superstore. Riiiight... Utube Burger is also a sportsbook. Being that I am one of the few people in this world who has zero interest in professional sports, sports television and sports betting, I asked the hostess if there was a location in this establishment that wasn't bombarded by television sets. She looked at me with a puzzled look and said "uh, no" and proceeded to walk me to a table in the center of the room surrounded by a wall of TV's on one side and smaller TV's on other sides. I motioned to an occupied booth in a slightly darkened corner, one that traded a prison wall of giant tv screens for a personal sized one in the booth. "Okay" the hostess said, while unloading me and the menu. I wonder what would've happened if I snatched the remote control and put on Bravo. I glanced at the menu and ordered a Manly Burger and Maple Bacon Sweet Potato fries. I probably should've taken the time to inspect the menu to see if all of the "no substitutions" nonsense was on this menu as well. The condiments arrived in tasting spoons. "Garlic Aioli", "Diablo Sauce" (red peppers and mayo), "Jalapeno Ranch" and "Umami house-made catsup." Umustbejoking catsup is the fruity, sweet stuff that isn't spicy, salty and tangy. Not a fan of catsup, bring on the Heinz. A short time later the food arrived. Maple Bacon Fries ($6) - sweet potato fries covered in maple glaze bits of bacon and chives. The double sweet went great when dipped in the Diablo and Jalapeno ranch sauces. The promised bacon pieces were few and far between. I should've ordered regular French Fries. 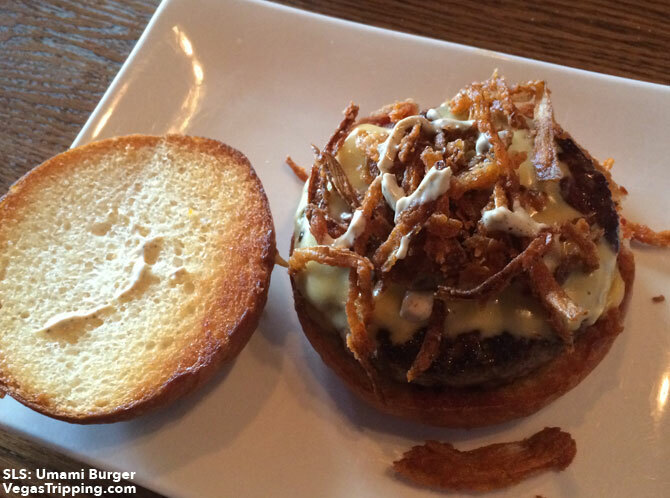 The Manly Burger ($12) - cheddar cheese, bacon lardons, onion strings, ketchup and mustard spread. Looks different compared to the preview version one. Looks like SLS was a little light on the cheddar cheese and even lighter on the mustard spread. Taking a look inside - pink, not purple... this is medium rare. The burger was tender, flavorful and perfectly cooked. Other than the the off-kilter mix of expected toppings (which a something a first-timer might not notice) it was still tasty. On the way out, I poked my head out onto the Beer Garden. There were no patrons out there as the weather was frighteningly hot despite the protection of landscape painted curtains. The only employee out here was cheering at a hockey game on TV. Antlers! Lunch for one with a soft drink came to $23.24 with tax. I've had the opportunity, but never tried this place due to the LA review. I dislike eating blood and pathogens from my cooked mammal, so I always go medium well. I also usually order burgers veggie-free like a five year old, though I can get by with nothing pickle/onion based if absolutely necessary. Reading their menu is a minefield of NOPE. I guess I should call them someday and ask them how much they're willing to sacrifice their brand identity for my business. Looks interesting so if I wander down this way when i hit town during VIMP I will check it out. I do love a good burger.